Twitter viewed as "a police scanner for the digital world"
Officer: "It's a different way to open up communication with the community"
(CNN) -- When a report of a possible explosive device on the roof of a city parking garage came in to the Lakeland, Florida, Police Department, public safety officials there sprang into action. 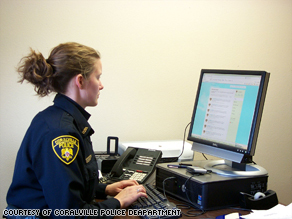 Community Relations Officer Meleah Droll updates the Coralville Police Department's Twitter account. They sent out a squad to investigate and they posted a notice on Twitter. Social networking sites like Twitter and Facebook are mostly used by those who want to keep their friends and families informed about their lives and activities. But increasingly, police and fire departments across the country are tapping into social networking to disseminate information to the public. "We think the police department has an obligation to get information out to the community through whatever means or mechanisms we have at our disposal," said Lakeland Police Assistant Chief Bill LePere. "Traditional media releases, expecting the local print media to pick it up and run it in the newspaper tomorrow, is 24 hours too late." With Twitter and Facebook, there is immediacy. Information can be shared as quickly as the poster can hit send. In an emergency, who do you call? Public safety officials are finding the use of sites to be not only speedy, but also a convenient way to distribute press releases, Amber alerts, road closings and suspect descriptions. Bruce Frazier, public relations specialist for the Dalton Police Department in Dalton, Georgia, said the way in which Lakeland police utilized Twitter is exactly what he envisioned when his department started using the site a few weeks ago. His department has a blog and Frazier said he learned the value of being able to keep the public updated quickly in October after a bombing at an area law firm. "[The bombing occurred] across the street from an elementary school," he recalled. "I was on the scene there pounding away on my PDA trying to send out press releases letting people know what was going on with the evacuation, what they needed to do to pick up their kids." "If we had been using something like Twitter, it would have been something quick that I could have been able to send something out from my PDA." With Twitter, users have up to 140 characters per "tweet," which is their lingo for a message. Each Twitter user can have "followers" who receive notification of the user's updates. Most of the police and fire departments number their followers in the dozens or hundreds, but many said the word can spread quickly when followers "re-tweet" to their friends or post the information from Twitter on their Facebook accounts. In Coralville, a suburb of Iowa City, Iowa, Police Department Community Relations Officer Meleah Droll has a follower in California who keeps up with her posts. After a bank robbery last fall in a neighboring city, Droll began twittering what she was hearing on the police radio, including a description of the alleged suspect. "I knew that you can turn on the alerts on mobile devices, so I thought that if there were people following that are getting this information on their phones, it just creates an extra set of eyes for us," she said. "It's a different way to open up communication with the community." Greg Whisenant, CEO of CrimeReports.com, said that given the state of the economy, those in public safety need to take advantage of every opportunity available to help citizens become more informed. "Budgets are getting cut and we need to find new and innovative ways to use tools to our advantage to engage the public," said Whisenant, whose site aids law enforcement agencies in communicating crime data to the public. The Boca Raton Police Department in Florida uses Twitter, Facebook and MySpace to communicate with residents. Mark Economou, public information manager for the department, said that like other police agencies, he follows the rules of what is public information in deciding what to post and tries to balance the public's right to know with the need not to annoy. "You don't want to inundate people by sending out too many tweets," said Economou, who added that he has used the site to publicize stories like the officer and citizen of the year, which might otherwise not get as much attention in the press. "You really want to pick and choose what you send out." In Shawnee, Oklahoma, residents can follow the police and fire departments on Twitter. Stephen Nolen, chief information officer there, said he has heard Twitter referred to as "a police scanner for the digital world," because those who have an interest in police and firefighting can stay informed through the site. Police officials said they aren't concerned about the public flocking to an active crime scene because they receive a tweet about an occurrence. "It's no different than the media showing up and broadcasting live feeds from the area, citizens in the area that call their friends or post video from their cell phones on YouTube," said LePere. "I don't expect that we are going to get a massive influx of people." All About Police • Twitter Inc. • Facebook Inc.